School District 52 is looking for community members to participate in a survey regarding the After School Sports & Arts programs. Read more for links to the survey. Our After School Sports & Arts program is being evaluated. The developers of the program want to know whether parents are seeing benefits for their child. 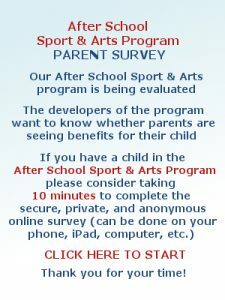 *If you have a child in the After-School Sports & Arts program please consider taking the anonymous survey.